I’m sure you’ve noticed a new craze in town – Mid-Century Modern love. Peruse any real estate listing site or blog, and you’re sure to see fans gushing over ranches of all sorts from the 1950’s to 1970’s. Almost hidden in Portland, Reedwood is a quiet little neighborhood full of Mid-Century Moderns. In fact, it is the perfect place to see all sorts of homes from the era. As you enter the neighborhood, you can’t help but notice this beautiful home. Sitting on a curved street, typical of the era, the house sets the tone for the entire neighborhood. I asked my friend, Eric Wheeler of Positively Portland Walking Tours, to explain the home’s style. This Tri-Level (1958) at 5205 SE 36th Avenue in Reedwood is a fine example of the “modern” residential style that the American public embraced in the 1950s. The rectangular horizontality of the house shape, cathedral ceiling, exposed beams, clerestory picture windows, brick half-wall and chimney, and prominent garage are all defining elements of this style. This house was built as a model home for the newly developed Reedwood subdivision located just north of Reed College. Reedwood is one of the most close-in and intact Mid-Century Modern neighborhoods in Portland. One of the tell-tale aspects of this auto-centric inner SE Portland development is the lack of sidewalks! A major shift in residential design style occurred in America in the years after World War II. One important factor in this shift was the demographic move away from high-density urban living to a low-density, automobile-dependent suburban lifestyle. Suburban developments tended to feature larger lots that made single-story, large footprint homes more feasible. Ranch style is the most inclusive term for the form that typifies the “modern” or “contemporary” house of the post-war period. A term that is now widely used for this style of the mid-20th century period is “Mid-Century Modern” or “MCM.” This low-profile house, with large window openings and easy access to both an attached garage and the outside, evolved from several stylistic influences. The Prairie School and Frank Lloyd Wright’s Usonian design had a major impact on Ranch style designs. The minimalist aesthetic of the International style and the influence of the traditional working ranch home of the western US, are seen in many mid-20th century residential designs. The Mid-Century Modern homes of the 1950s and 1960s featured elements rarely seen in houses before WW II. These features often included a walk-out basement with finish similar to the above grade living area. Family rooms, recreation rooms, and TV rooms became popular, sometimes replacing a formal dining room. Attached garages became a necessity, not a luxury, and many MCM homes had concrete patios or wood decks to the rear of the house instead of open or enclosed front porches. You will see many variations of the popular Ranch Style House as you drive or bike around many outer Portland neighborhoods. 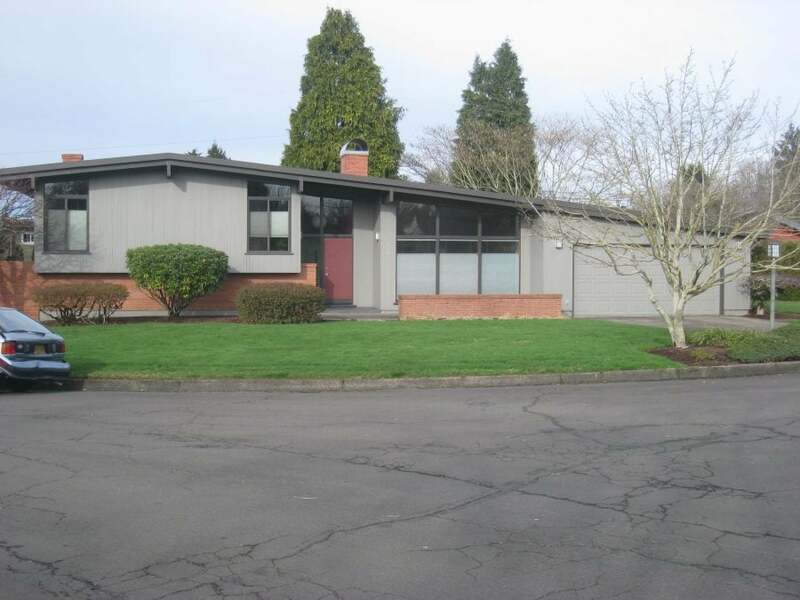 In fact, Eric and I have discovered another neighborhood full of Mid-Century Moderns in NE Portland. Thanks Eric for sharing your expertise and your great photo. Do You Have a Website Strategy and Plan?